Abstract: Pat is a 55-year old female. She came to us on 1 August 2011 complaining of coughs, discomfort and uneasiness inside her. She was prescribed Cough No: 5 for her cough with white phlegm. The cough went away after a few days. She underwent detoxification with the e-Therapy. She took herbal tea to normalize her disharmonised liver meridian. Within a week there was no more heart palpitation. Introduction At patients’ first visit to CA Care, we usually say, “Tell me your story and what is your problem?” With that opening remark, the consultation session drags on, sometimes for hours. When patients come for their second visit, the question we generally ask is, “Are you getting any better after the herbs?” Answers given by patients are often subjective clouded by personal bias. Scientists say such method of evaluation is not scientific. Anecdotal evidences are mere stories and are of little value. While it is good to hear that patients are getting better, we are aware that “getting better” varies from people to people depending on their perspectives. It would be good if we could have a tool that can objectively measure patients’ well-being, besides accepting patients own evaluation at face value. According to the dictionary, objective evaluation means evaluation that is free of personal bias and opinion. Over the past one and a half years, we have been using the AcuGraph to collect data and monitoring our patients’ progress. One fact that stands out – AcuGraph is a good tool for objective evaluation of patients’ wellbeing. The hypothesis can be simply put this way. 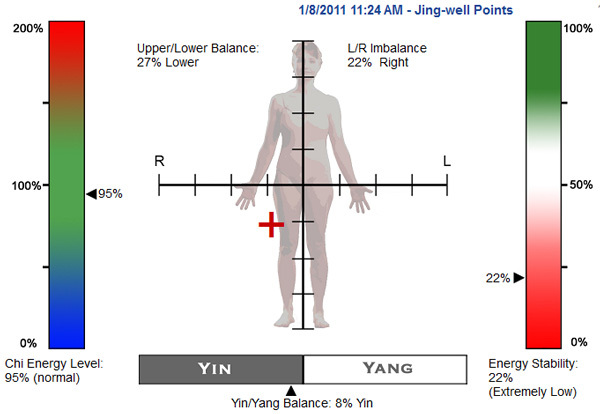 If patients show much energy imbalances, the chances are they do not feel good or well. 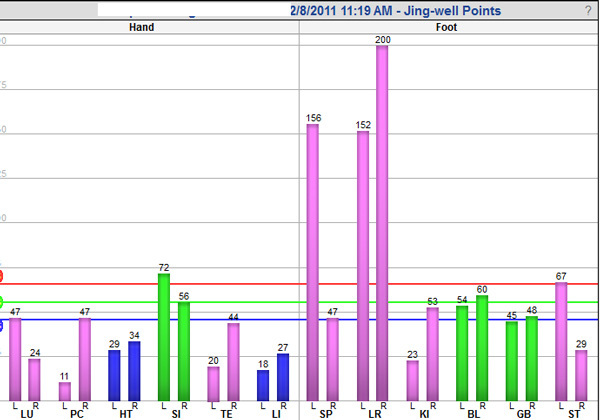 If they say that they are getting better, their AcuGraph readings should show improvements in their energy balance. Pat (not real name) is a 55-year old female. She came to us on 1 August 2011 complaining of coughs, discomfort and uneasiness inside her. This is not a cancer case – which we generally do not handle. But because she often accompanied her brother (with lung cancer) to our centre, we took it as our responsibility to help her as well. 5. AcuGraph reading on 5 August 2011. 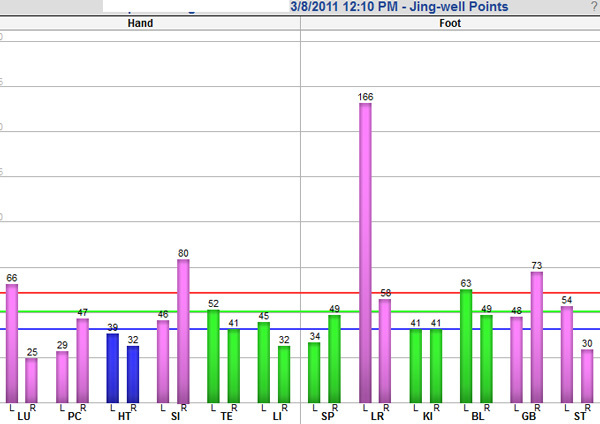 Since her cough had resolved, we prescribed Pat A-Liver 2 herbal tea to correct her LR imbalance. 6. 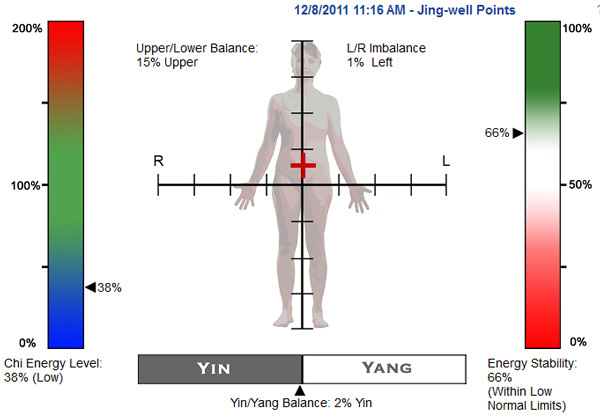 AcuGraph reading on 12 August 2011, after taking A-Liver-2 herbal tea for a week. 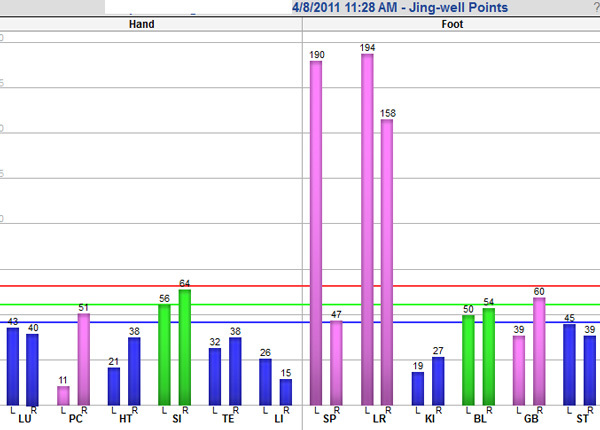 Below is a comparison of her bioenergetics, on 1 August 2011 (top) vs 12 August 2011 (bottom). 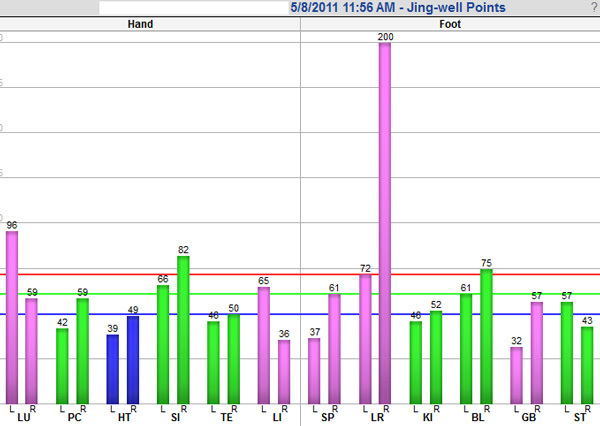 Reading on 12 August showed a more stablised and more balanced energy distribution. At CA Care, we value patients’ feed-back about their wellbeing. If a patient says he/she is doing better, who are we to dispute that? Yes, the “experts” and statisticians would! They would say the “feel good” feeling is subjective and is also no more than a placebo effect. Since wellbeing cannot be seen on a CT scan, neither can it be measured by any medical device, we propose that the only objective tool we can have is the AcuGraph. 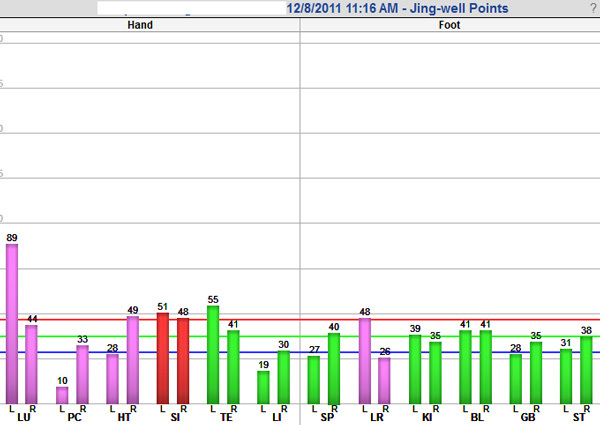 The “feeling good” feeling is correlated with a more harmonious Qi balance in the body. 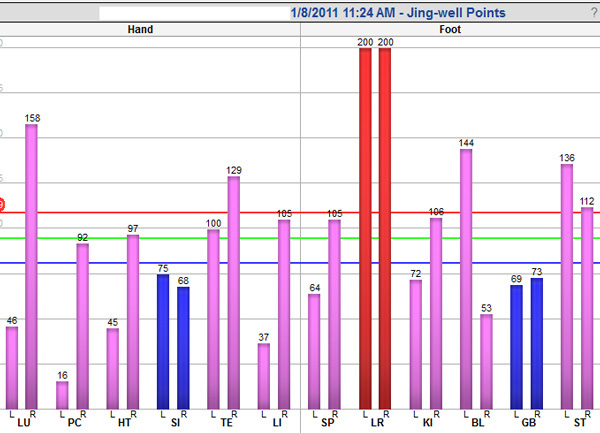 That is a reasonable and professional presentation of measurement for a patient’s progress: both quantitatively and qualitatively. thanks for the continuous quest for a better treatment option for the suffering patients, and sharing with likeminded therapists like me.